Both units are powered by Epson’s 4K PRO-UHD resolution enhancement technology and content is supported at 4K HDR at 60Hz. Dynamic contrast ratio is claimed to achieve 1,000,000:1, DCI-P3 color space is supported, and both projectors include Epson’s 15-element glass projection lens. 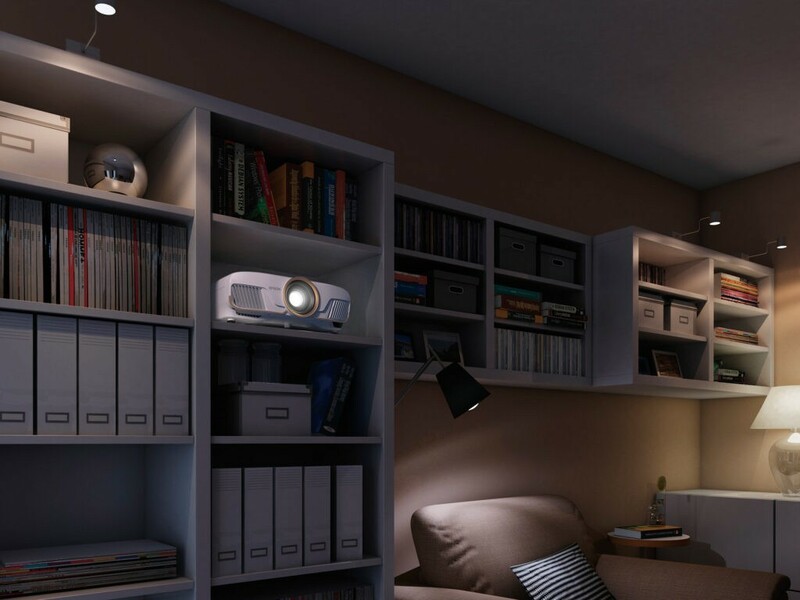 As is typical for Epson home theater projectors, a wide lens shift of up to ±96 percent on the vertical axis and up to ±47 percent on the horizontal axis is supported. The new projectors also feature low Delta E and include a CalMAN pattern generator calibration tool. Both the new Home Cinema line projectors are now available through certain e-tailers and the Epson online store, and come with the company’s comprehensive service and support package, including toll-free access to Epson’s PrivateLine priority support, 90-day limited lamp warranty, and free two-business-day exchange with Extra CareSM Home Service. The Home Cinema 5050UBe and 5050UB also include a two-year limited warranty. For more information and detailed specs, visit www.epson.com/home-entertainment-projectors. Something like this could very well be the replacement for my trusty Epson 5030. No plans or budget to upgrade in the foreseeable future, but I think I’d be inclined to stay in the Epson family given how positive an experience I’ve had with my last two Epson projectors. 3D is still a bigger priority for me than 4K – I have zero desire to watch a 2D 4K presentation of something I have in 3D. That’s part of what’s holding me back on an upgrade. The majority of new releases I’m picking up still have a 3D component. As the newest version in the ub40xx line, it really wouldn’t make sense for them to start dropping features like 3D or lens memory. As I recall every time a new projector comes out the retail sites fail to list 3D as a feature because Epson doesn't consider 3D to be that big a deal and they bury any mention of it in the fine print. Eventually the retailers will update the specs to include it. I think that’s a great approach – they keep the feature there for those of us that want it, but don’t scream about it so loud that the anti-3D brigade would start demanding that since they don’t use it, it should be removed to lower prices. It’s just there for those who want it, no need to make a fuss. I like that. My first Epson 5030 developed a dust blob, under warranty, as did its replacement unit, which was by that time out of warranty. Later, the replacement unit developed a vertical green line, which necessitated a new motherboard — a $1,000 repair. And if you read Amazon reviews for the 5040, you’ll find myriad complaints about its repair record. So although I’ve been happy with the performance of the 5030, my next projector will be from some other manufacturer, with a better reputation for reliability. Doesn't surprise me. There were a lot of us on the AVS Forum back in 2013/14/15 who were having ongoing issues with dust blobs and badly aligned panels on 'refurb' units of several models that were shipped out to unhappy customers at the time. We all came to the realization that Epson was just recycling projectors on their next-day replacement program that clearly weren't retested in the lab before dispatch. I personally won't go back to Epson again for that reason despite the increasingly impressive performance credentials of their new lines. So I'll be looking for demos on projectors when I get serious about shopping for new gear. In the meantime, I'll be reading more about this Epson. As a counterpoint to the discussion, I’ve had Epson projectors since 2007. I’ve never had an issue with dust blobs despite living in some dusty places. I’ve never had an issue with the actual protectors. I did have an issue when I ordered my first projector, it was a clearance model and it was stolen while en route to delivery, and they didn’t have any more in stock so all they could do was refund me. But they ended up going above and beyond that. I ended up getting the same model from another retailer for slightly more than Epson had been selling it for. They made up that cost difference, provided me with an extra lamp, and extra ink cartridges for my Epson printer – I didn’t ask for anything, they offered all of that unprompted. I was really impressed by that gesture. I read the first look article, and I'm now quite intrigued. This is half the price of the JVC RS2000 / NX5. With this projector, I could possibly do my entire household 4K upgrade for the same price total as just the NX5. I'm having very similar thoughts as I'm tired of being on the fence with 4K and ready to move forward. Life Is Too Short. At this price point I wouldn't be expecting "magical" results. I probably would if I paid the entry cost for the JVC, though it remains on my shortlist. I'd be coming from the [venerable] Panasonic PT-AE8000. While quite awesome in it's day it is still old school 1080P so I know either of these will represent a significant improvement. Honestly, if this model were available in black my decision might be all but made but a white projector will detract from the overall aesthetic of my room. I don't understand why manufacturers continue to produce white projectors targeted to the medium to high end HT markets when they [should] know their products may likely be used in dedicated rooms. That sounds like a “wife” comment to me. :) Honestly, with all the equipment I’ve bought over the years I don’t think I’ve ever cared (or even much noticed) what color it was. I only cared how it performed. Honestly, with all the equipment I’ve bought over the years I don’t think I’ve ever cared (or even much noticed) what color it was. I only cared how it performed. Do you have a dedicated room? Does it have a color scheme? Mine does. Yes, to dedicated room. No, to color scheme. I only painted the walls a very dark gray to reduce glare and to make it a truly darkened room where you can't see the colors of the equipment anyway! Yes. White projector bad. Probably unacceptable for my room. I’m also seeing good things about the similarly priced BenQ projectors. Might be a better choice than the Epson, IIRC, for HDR. The benq build quality and UI design are generally nowhere near Epson or JVC league. I don’t know where I’m at on 4K at this point. I was really excited to upgrade this Fall. But now, I’m in a 4K funk. Here we are in 2019, four or five years after the launch of UHD, and it still feels like a mess. And I’ve got a big library of unwatched HD material. These new projectors are sounding good. But it’s still really hard, due to the niche market, to get a comparison between these “budget” models ($3000) and the “mid range” models ($8000). The fact that I call $3000 “budget” pricing also speaks to the projector problem. And I still watch a lot of cable TV which is 4K. I remain highly ambivalent, tipping back and forth depending on whether I feel itchy for new tech or anxious to not spend the money. A big part of it is I don’t ever see 4K HDR so I have no FOMO. It’s not like DVD or Blu where the demos were obvious at Blockbuster and BestBuy, which I was at frequently then. With 4K, I can’t really tell a difference on a BestBuy showroom. Maybe this Summer I can get out for some demos in the NoVa and DMV regions. Maybe visit Sam again, even try to get up to see Ron’s JVC. How a company can dare to call a faux 4K projector "Pro" is beyond me. I always thought misleading advertising was illegal. If memory serves, you're currently running a Sony model, [correct?] but I don't know how old. For me it's more a question of how much money do I need to spend. My Panasonic was originally released in 2012 and is now ready to assume a backup role. It has no Ethernet port so IP control is a "no go," and also, like you, I am amassing a decent number of 4K titles and anxious to see them in the best available [on a consumer level projector] quality. I doubt "true 4K" is something I would even notice at reasonable seating distances but I am very interested in HDR and WCG. This new Epson is looking like a serious contender on both fronts and is also seriously bright. I lamented my concerns to my wife [again] earlier today and she said I should just go ahead and get the JVC so as to have no regrets. Epson’s 5000 line (of which I have the 5030) also has a sibling line, the 6000 series, which are considered to be the “pro” versions. The electronics under the hood are generally the same, but the 6000 series has historically had the black coloring, been shipped with extra bulbs and setup options and costs a little more. The color doesn’t really matter to me since my projector isn’t visible from where I sit during the film, but I do understand the concern. The thinking on the 5000 line might be that the whiter color works better with rooms that are multipurpose. I was also aware of this so I looked yesterday but found no 6 series equivalent to the 5050 on Epson's site. Hopefully it's forthcoming? Agreed. Since they do offer the pro series it makes perfect sense. Personally, I prefer a "fluid" aesthetic in my room so the 5050 would not fit. If a "Pro" version of this one emerges it will get serious consideration but will ultimately still have to beat out the JVC RS2000. I would guess so – the 6030 was available around the time of the 5030, and for me, wasn’t worth the extra money – but it was an option available at the time I was PJ shopping. I’m guessing you’ll see a 6050 released around the same time that the 5050 comes out – it may be limited to dealers only and not directly to consumers in the initial offering, I think that’s happened in the past. I have the Sony 40es, bought in 2016 for about $2500. It was between that and the Epson 5030 IIRC. This Sony model was launched late 2014 maybe? It and the Epson were too HD models then. 4K was just debuting with $25k+ models and shortly after I bought the first eshift models came out in the $4000 range. And likewise, I believe I can’t really see 4K. But HDR and WCG should be a real upgrade for me. If i'm not mistaken, the 6000 series also includes a mount, and the ability to use an anamorphic lens. Considering all those extras and possibly a deal, its makes sense to at least put it in the running. As far as when it may come out, I've heard May from another forum. Past 6000 series models have indeed included those things. Problem with that is that it makes it harder to search for a pj that has 3D. You have to pull up every model and search the fine print to see if it's even included. And sometimes it's not even noted there! Not helpful hiding a major selling point, especially for those who are looking for replacements for their 3D panel sets. And most reviewers don't help. They often to mention it either. And with many, even if its mentioned it's included, they dont bother testing the 3D to see how it compares to other models. Too busy counting nits and pixels to be bothered I guess. But at this point, and I don't mean to sound like a downer, I'm just glad that 3D in projectors remains readily available. They could have dropped it just as easily as the TV manufacturers did, and they haven't.